A NEW REVOLUTIONARY PAYMENT SOLUTION FOR MALAYSIA AUTOMOBILE / COMMERCIAL VEHICLES INDUSTRY WE transform and DIGITIZE the commercial vehicles industry! TTPAY is a revolutionary payment method and solution specifically dedicated for online commercial vehicles marketplace in Malaysia.Unlike other online automobiles or commercial vehicles classification sites and marketplace platforms, they don't have a proper payment gateway solution between buyers and sellers. It was usually done by lengthy traditional payment method, involving contacting sellers for banking details, awaiting confirmation between buyers and sellers with plenty of unnecessary manual processes. Therefore, TTPAY is introduced as the simplest and the smartest way to connect and process the transactions between buyers and sellers with fast, easy and secured payment process with minimize waiting time. Just treat your TTPAY as similar as your own wallet! Inside your TTPAY account there got TTCASH and TTCREDIT! TTCASH just like your cash in your wallet, it can uses for any purchase from TruckTrader in anytime and anywhere with no charges at all! CREATE A FREE TTPAY ACCOUNT! Besides, TTPAY is the one of the simplest payment gateway solution to earn rebates and discounts via TTCREDIT that allows you to not only save more money, but also get more rebates and benefits from it! 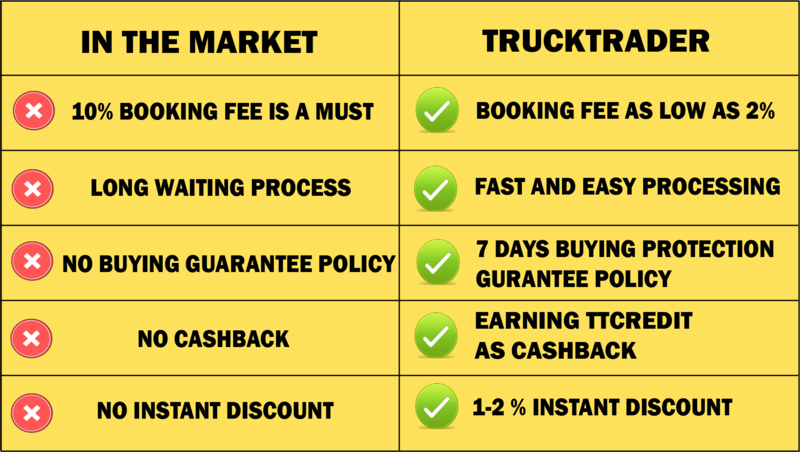 Time to get your TTPAY account for FREE now while get RM10 TTCREDIT into your new TTPAY account and enjoy your INSTANT DISCOUNT on every purchase in TruckTrader! GET YOUR RM10 TTCREDIT FREE! USE YOUR TTPAY IN ALL CATEGORIES IN TRUCKTRADER! CREATE FREE TTPAY WALLET NOW! GET FREE RM10 CREDIT INSTANTLY NOW!